Electronic Waste: Toxicology and Public Health Issues discusses the major public health concerns due to the presence of toxic chemicals that are generated from improper recycling and disposal practices of electronic waste (e-waste). 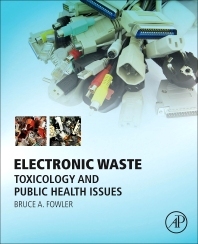 This book highlights hazardous inorganic chemicals found in e-waste, including arsenic, cadmium, lead, mercury, gallium, iridium, and nanomaterials, also focusing on health issues related to the presence of BPA, styrene, and other plastic components and combustion products, while also identifying populations at special risk. To provide readers with potential solutions to this global problem, Dr. Fowler presents risk assessment approaches using chemicals, mixtures, biomarkers, susceptibility factors, and computational toxicology. He discusses how to translate the information gathered through risk assessment into safe and effective international policies. The final chapter is devoted to future research directions. This is a timely and useful resource for all those concerned with the health issues surrounding e-waste management and proper disposal, including toxicologists, public health and policy officials, environmental scientists, and risk assessors. 4. Global Distribution Steams of E-Waste—Where Does It Go?